O God, Creator of all things, who laid down for the human race the law of work, graciously grant that by the example of Saint Joseph and under his patronage we may complete the works you set us to do and attain the rewards you promise. Through our Lord Jesus Christ, your Son, who lives and reigns with you in the unity of the Holy Spirit, one God, for ever and ever. The feast of St. Joseph the Worker was established by Pope Pius XII in 1955 in order to Christianize the concept of labor and give to all workmen a model and a protector. 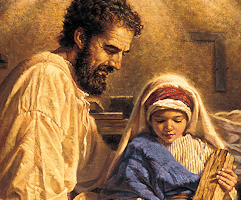 By the daily labor in his shop, offered to God with patience and joy, St. Joseph provided for the necessities of his holy spouse and of the Incarnate Son of God, and thus became an example to all laborers. "Workmen and all those laboring in conditions of poverty will have reasons to rejoice rather than grieve, since they have in common with the Holy Family daily preoccupations and cares"(Leo XIII). "May Day" has long been dedicated to labor and the working man. It falls on the first day of the month that is dedicated to the Blessed Virgin Mary. Pope Pius XII expressed the hope that this feast would accentuate the dignity of labor and would bring a spiritual dimension to labor unions. It is eminently fitting that St. Joseph, a working man who became the foster-father of Christ and patron of the universal Church, should be honored on this day. The texts of the Mass and the Liturgy of the Hours provide a catechetical synthesis of the significance of human labor seen in the light of faith. The Opening Prayer states that God, the creator and ruler of the universe, has called men and women in every age to develop and use their talents for the good of others. The Office of Readings, taken from the document of the Second Vatican Council on the Church in the modern world, develops this idea. In every type of labor we are obeying the command of God given in Genesis 2:15 and repeated in the responsory for the Office of Readings. The responsory for the Canticle of Zechariah says that "St. Joseph faithfully practiced the carpenter's trade. He is a shining example for all workers." Then, in the second part of the Opening Prayer, we ask that we may do the work that God has asked of us and come to the rewards he has promised. In the Prayer after Communion we ask: "May our lives manifest your love; may we rejoice for ever in your peace." The liturgy for this feast vindicates the right to work, and this is a message that needs to be heard and heeded in our modern society. In many of the documents issued by Pope John XXIII, Pope Paul VI, the Second Vatican Council and Pope John Paul II, reference is made to the Christian spirit that should permeate one's work, after the example of St. Joseph. In addition to this, there is a special dignity and value to the work done in caring for the family. The Office of Readings contains an excerpt from the Vatican II document on the modern world: "Where men and women, in the course of gaining a livelihood for themselves and their families, offer appropriate service to society, they can be confident that their personal efforts promote the work of the Creator, confer benefits on their fellowmen, and help to realize God's plan in history" (no. 34). Patron: Against doubt; against hesitation; Americas; Austria; diocese of Baton Rouge, California; Belgium; diocese of Biloxi, Mississippi; Bohemia; diocese of Buffalo, New York; bursars; cabinetmakers; Canada; Carinthia; carpenters; China; Church; confectioners; craftsmen; Croatian people (in 1687 by decree of the Croatian parliament) dying people; emigrants; engineers; expectant mothers; families; fathers; Florence, Italy; happy death; holy death; house hunters; immigrants; interior souls; Korea; laborers; diocese of La Crosse, Wisconsin; archdiocese of Louisville, Kentucky; diocese of Manchester, New Hampshire; married people; Mexico; diocese of Nashville, Tennessee; New France; New World; Oblates of Saint Joseph; people in doubt; people who fight Communism; Peru; pioneers; pregnant women; protection of the Church; diocese of San Jose, California; Sicily; diocese of Sioux Falls, South Dakota; social justice; Styria, Austria; travellers; Turin, Italy; Tyrol, Austria; unborn children; Universal Church; Vatican II; Vietnam; diocese of Wheeling-Charleston, West Virginia; wheelwrights; workers; working people. May 1 is celebrated in Communist countries as the Day of the International Solidarity of Workers. Today would be a good day to pray for athesistic Communism's influence to cease and a proper application of the principles explained by Leo XIII in Rerum novarum and John Paul II in Centesimus annus to be the guide used by nations. As a young man St. 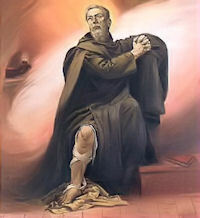 Peregrine was a member of an anti-papal party until he encountered St. Philip Benizi, the head of the Servite order, who had been sent to try to reconcile the divided community. While trying to preach in Forli, Philip was heckled and even struck by Peregrine, who was overcome by momentary political fervor. But that moment also changed Peregrine. He began to channel his energies in new directions, engaged in good works and eventually joined the Servites in Siena and went on to be ordained a priest. Returning to his home town, he founded a new Servite house there and became well known for his preaching and holiness as well as his devotion to the sick and poor. One of the special penances he imposed on himself was standing whenever it was not necessary to sit. Over time, Peregrine developed varicose veins and, in turn, cancer of the foot. The wound became painful and diseased and all medical treatment failed. The local surgeon determined amputation of the leg was called for. Tradition has it that the night before surgery was scheduled, Peregrine spent much time in prayer before the crucified Jesus, asking God to heal him if it was God’s will to do so. Falling asleep at one point, Peregrine had a vision of the crucified Jesus leaving the cross and touching his cancerous leg. When Peregrine awoke, the wound was healed and his foot and leg, seemingly miraculously cured, were saved. He lived another 20 years. Peregrine was canonized in 1726. Excerpted from Saint of the Day: Lives, Lessons and Feast by Leonard Foley, O.F.M.